Menu used aboard the Union Pacific Domeliner, "City of Portland," which ran between Chicago and Portland, Oregon. 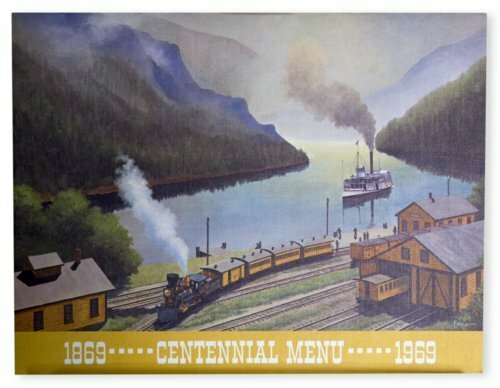 The "Centennial" reference is for the 100th anniversary of the driving of the Golden Spike at Promontory Point, Utah in 1869. The artist of the cover illustration, Howard Fogg, was a noted railroad artist. The title of the original work is "Columbia River Portage Point."